Might as well be first. As some of you might already know from my machine review, I started off with a Lucy, and rebuit a San Marino CK. The Ponte Vecchio Lusso was mentioned to me, and I was really interested in this style of machine. Temperature stable, no noise, low maintenance, easy to use and steam that's powerful enough, but not overly powerful. Here's a piccy of my machine, with Anger Management's completed custom handles and taps. Yes it's not perfect, but it's a great machine for the home. Small footprint for 2 groups, it can steam and steam for ages. I would have liked an antivac to speed up the machine when turning it on, but that's a mod I'm working on. Great support from Jack at Sorrentina Coffee too. Those custom handles and knobs look 'boss!' Would you remind us of the wood used. It looks like some sort of oak but too dark to be Silky... Tassi perhaps? The whole machine looks amazing! AM will know what wood it was. I just know they look nice, feel nice and are an improvement on the dull boring black plastic knobs and handles. AM's done a great job! As usual, he even made one of the portafilters a naked for me. Makes a big difference to the useabillity (the spouts are useless). 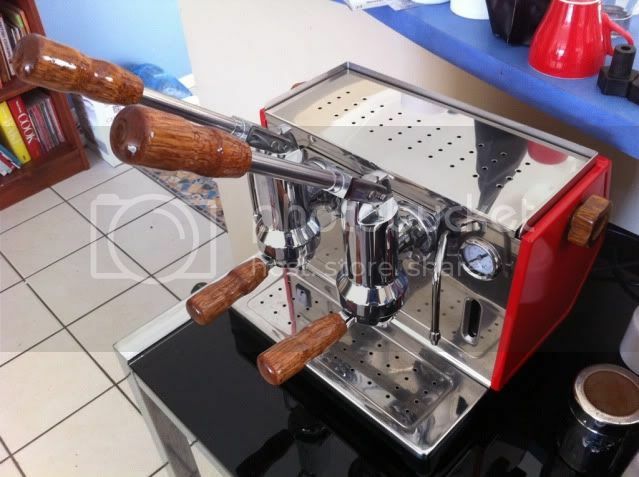 The Cimbali and Pavoni were the start of the addiction and still love them both. The 3 grp Izzo has just turned out to be a happy accident that is/has made me a few $$ toward paying off the addiction. The Fioranzato has been doing stirling service in the shed since February this year as the Izzo sits beside it unused. Different machine to the Izzo and not as forgiving but has been the testbed for a lot of playing with different beans, baskets and settings. Pictured here part way through installing a rotary boiler feed pump under the bonnet. ps.... the bike looks like it needs some work or is that just dirty wheels and a bad landing? Lacehim, that's a truly stunning machine, AM's beautiful woodwork notwithstanding. I think that when upgraditis strikes again, one of these might be in the cards. I'm going to have to invite myself around for a brew one of these days. Well there's a FB button at the bottom of the page which I guess allows you to add this thread to your own page and 'Like' to your hearts content. Nice piece of equipment Lacehim. Looks great. The hot water and steam taps look like they may be tricky to make. Can you turn that out on a lathe AM? Well this is a Lever machine photo page but I don't think many would be interested in a pic of the brew lever of my machine. I've pondered scooping up one of the La Pavs that often come up for sale on CS but I have more brewing methods than I can poke a forky stick at. Reminds me of the Telstra 1234 TXT Directory Assistance ad on TV with the highly efficient green sock throwing all his pens up into the false ceiling.........camera pans up to the ceiling and it collapses with hundreds of pens falling down. And to Rider that was a few months ago and was in for a bearing change and demud after some cyclocross type riding. Love playing in the mud not. It's the Orphan Espresso Hand grinder Derrilex. http://www.orphanespresso.com/OE-PHAROS-Hand-Coffee-Grinder_p_3977.html Uses conical burrs. That's one of the first ever made too if I'm correct. Lovely machine galumay, but too much stuffing about mate grinding them beans. Would 0.1gm of beans extra really matter? I love my Vario, grinds straight into the handle and nice and fluffy. Nah, its all part of the routine, and hey I might not be able to see/taste the difference with 0.1g but i certainly can with say 0.5g and a big Lever like the Pompeii. The difference between amazing shots and god shots is only achieved with attention to detail! The Pharos grinder is an amazing bit of kit, mine is the first made as mentioned, it gives a grind quality of a Robur in a $300 machine that retains nearly 0 grinds and makes no mechanical noise! Just to comply with the title of the thread! wow - that's excellent production values on the video, galumay! Geeze mate, you're pressed for space there. I reckon you've used what space you have very efficiently.. And wisely!!! Nice pic! And here is my new toy courtesy of a Kelsey/Lacheim link on chat the other night. I made him an offer he couldn't refuse and he stopped his ebay auction. This way I got to inspect is closely before buying. It's fairly mint condition and the group seal and showerscreen despite not being cleaned by him EVER were almost spotless. Some holiday fun on the way for me!! I've ditched the fake milk frother for fear he'd never cleaned it also and replaced it with the original steam wand from the box. Here is a bad low-light photo. my latest addition has arrived, just qualifies as a lever!